Pensuinea Rozalia is a warm and welcoming family guesthouse with amazing home cooking in the Saxon Village of Crit. Rozis legendary cooking is also available for groups who are not staying. 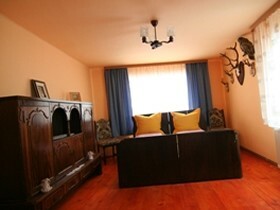 Pensuinea Rozalia is a small family run guesthouse in the village of Crit. It is a haven of genuine hospitality and after a day or two you will gain another mother! There are 4 comfortable guest rooms 2 of them linked and perfect for families. There are 2 shared bathrooms. Rozalia provides excellent home cooking for her guests and is a small producer and member of the Saxon Village Preserves Presidia. As well as Jams and preserves, Rozalia produces wonderful dried herbs and medicinal teas using one of the Fundatia ADEPT solar driers. Her products can be bought directly from her or through the Saschiz Tourist Information Centre. Dinners and lunches can also be booked independently of staying in Crit. The excellent traditional dishes often include local wild boar or venison and are washed down with excellent local wine and followed by sweet desserts! Crit is a perfect base for exploring Tarnava Mare and makes an excellent stop on the Tarnava Mare Long Distance Walking Route. Bikes can also be hired through Saschiz Tourist Information Centre and brought to Crit for you.